Portraiture is an exciting and most rewarding collaboration between artist and sitter and an opportunity to create something of value that will give lasting pleasure. Shown here is a detailed small painting; on other pages you will find more examples of my work- quick pastel sketches, more portrait paintings in oil and pastel and portraits of animals, some painted entirely from life, some from 'photos, and some from a combination of life and 'photos. Please call if you are considering commisisoning a portrait or would like more info- I'm happy to advise and answer enquiries, with no obligation. These are very delicate and beautiful portraits. For this small 6x6" painting I used a method based on a traditional layered technique and glazing which gives the skin tones and colours a delicate translucency. Unlike an 'alla prima' sketch which is painted in one sitting, layered portraits can take many hours to complete resulting in a rich yet delicate patina. 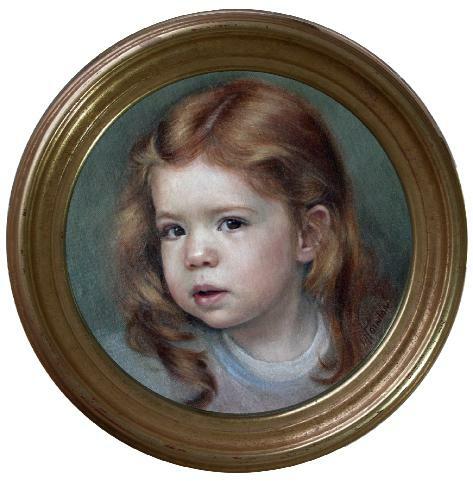 This small portrait was painted on a fine portrait linen glued onto a panel.